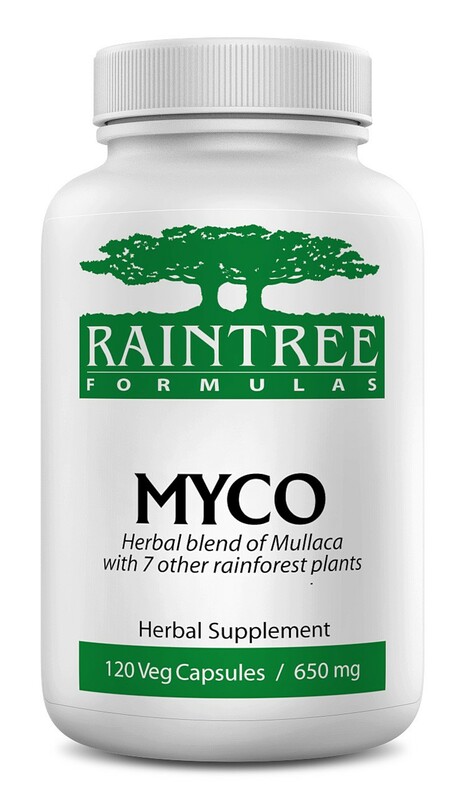 Myco formula from Raintree - potent herbal immune aid to support against foreign harmful organisms. Experience plant-based nutrition in a new way with Raintree's herbal supplements, carefully designed with your wellness in mind. Raintree Myco is carefully crafted from indigenous plants grown in pure, nutrient-rich soil and cultivated without harmful chemicals to deliver superior comprehensive support to your health. For maximum benefit, we recommend using both Amazon A-F and Immune Support in conjunction with Myco. We also have a MYCO Stealth Package available containing all three of these supplements. By following your physician’s care, eating a nutritious diet, and supplementing with Raintree Myco formula, you can provide your body the support it needs. The plants in this formula – mullaca (Physalis angulata), Brazilian peppertree (Schinus molle), anamu (Petiveria alliacea), clavillia (Mirabilis jalapa), macela (Achyrocline satureoides), fedegoso (Cassia occidentalis), picão preto (Bidens pilosa), and uva ursi (Arctostaphylos uva ursi) – have all been chosen for their long-standing abilities to assist the body. Our Myco blend is designed with the selected botanicals because they contain beneficial micronutrients, including flavonoids, antioxidants, and alkaloids. When combined, they make up the synergistic formula designed to support the unique needs of your body in order to keep it clear and balanced. Recommended Daily Dosage: 2 capsules, 2-3 times daily, or as directed by a healthcare professional. This product may lower blood pressure. If you experience any yeast or fungal imbalance, our Amazon A-F formula can support your body. Supplementing this product with probiotics during or after your Myco course is recommended. All Raintree products are designed to support your nutrition and wellness plan. Our supplements are non-GMO, soy-free, gluten-free, and additive-free, made with ingredient purity in mind and the synergy of traditional herbal practices with modern science. Always consult a licensed healthcare practitioner before using new supplements, especially if you are currently on any other medications.